غلامیان, سیداکبر. (1397). زمان‌بندی مجدد قطارهای راه‌آهن شهری مبتنی بر تغییر الگوی توقف-عبور در شرایط ازدحام مسافر. پژوهشنامه حمل و نقل, 15(4), 323-346. 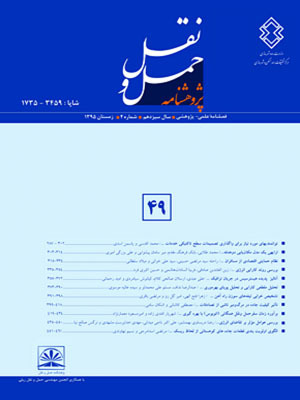 سیداکبر غلامیان. "زمان‌بندی مجدد قطارهای راه‌آهن شهری مبتنی بر تغییر الگوی توقف-عبور در شرایط ازدحام مسافر". پژوهشنامه حمل و نقل, 15, 4, 1397, 323-346. غلامیان, سیداکبر. (1397). 'زمان‌بندی مجدد قطارهای راه‌آهن شهری مبتنی بر تغییر الگوی توقف-عبور در شرایط ازدحام مسافر', پژوهشنامه حمل و نقل, 15(4), pp. 323-346. غلامیان, سیداکبر. زمان‌بندی مجدد قطارهای راه‌آهن شهری مبتنی بر تغییر الگوی توقف-عبور در شرایط ازدحام مسافر. پژوهشنامه حمل و نقل, 1397; 15(4): 323-346. امروزه، راه‌آهن شهری نقش کلیدی در حمل‌ونقل عمومی شهرهای بزرگ ایفا می‌کند چراکه این نوع سیستم حمل‌ونقل در مقایسه با سایر شیوه‌های متداول حمل‌ونقل همگانی دارای ظرفیت حمل‌ونقل و راندمان بالا در ارائه خدمات به حجم قابل‌توجهی از مسافرین است. در این پژوهش، یک مدل بهینه‌سازی دوهدفه با تلفیق رویکرد زمانبندی مجدد و الگوی توقف-عبور در شرایط ازدحام مسافر بعد از اتمام اختلال ارائه شده است. این مدل بر اساس نرخ ورود مسافر وابسته به زمان، جریان حرکت مسافرین را بر اساس برنامه زمان‌بندی شبیه‌سازی می‌کند. با توجه به پیچیدگی‌ مسائل زمان‌بندی مجدد حرکت قطارها، یک الگوریتم ابتکاری تولید جواب، مبتنی بر رویکرد تجزیه مسئله، ارائه گردید. اعتبارسنجی مدل زمانبندی مجدد به کمک آزمایش‌های عددی و بر اساس داده‌های عملیاتی از خطوط راه‌آهن شهری تهران و پکن انجام شده است. بر اساس نتایج مدل زمان‌بندی مجدد، با افزایش مجموع زمان سفر قطارها به میزان کمتر از 1% می‌توان ازدحام مسافرین در خط 5 راه‌آهن شهری تهران را حدود 35% کاهش داد. با توجه به ضرورت عکس‌العمل سریع بعد از اختلال، الگوریتم زمان‌بندی مجدد از کارایی لازم برخوردار است. نتایج تجربی نشان می‌دهد که حتی در مسائل با ابعاد بزرگ، رویکرد حل مسئله دارای کیفیت جواب مناسب و زمان محاسباتی قابل‌قبولی بوده که این موضوع نشان‌دهنده کارایی آن در برنامه‌ریزی مجدد قطارهای راه‌آهن شهری است. re-scheduling model was carried out using numerical tests based on operational data from Tehran and Beijing railways. Based on the results of the re-scheduling model, by increasing the total travel time of trains by less than 1%, the passenger overcrowding in line 5 of Tehran's urban railway could be reduced by about 35%. Regarding the need for a fast response after disruption, the re-scheduling algorithm is efficient. Experimental results show that even in large-scale test problems, the solution approach has a good quality response and computational time, which indicates its effectiveness in re-planning the trains of urban railways. - Canca, D., Barrena, E., Laporte, G. and Ortega, F.A., (2016), "A short-turning policy for the management of demand disruptions in rapid transit systems," Annals of Operations Research, Vol. 246, pp.145-166. - Clausen, J. (2007), "Disruption management in passenger transportation-from air to tracks," in 7th Workshop on Algorithmic Methods and Models for Optimization of Railways, pp. 30-47. - Cao, Z., Yuan, Z. and Li, D., (2014), "Estimation method for a skip-stop operation strategy for urban rail transit in China" Journal of Modern Transportation, Vol. 22, pp. 174-182. - Chang, C.S. and Thia, B.S., (1996), "Online rescheduling of mass rapid transit systems: fuzzy expert system approach" IEE Proceedings-Electric Power Applications, vol. 143, pp. 307-316. - Jamili, A. and Aghaee, M.P., (2015), "Robust stop-skipping patterns in urban railway operations under traffic alteration situation" Transportation Research Part C: Emerging Technologies, vol. 61, pp. 63-74. - Kabasakal, A., Kutlar, A. and Sarikaya, M., (2015), "Efficiency determinations of the worldwide railway companies via DEA and contributions of the outputs to the efficiency and TFP by panel regression," Central European Journal of Operations Research, vol. 23, pp. 69-88. - Kang, L., Wu, J., Sun, H., Zhu, X. and Wang, B., (2015), "A practical model for last train rescheduling with train delay in urban railway transit networks" Omega, vol. 50, pp. 29-42. - Kang, L., Zhu, X., Wu, J., Sun, H., Siriya, S. and Kanokvate, T., (2014) "Departure Time Optimization of Last Trains in Subway Networks: Mean-Variance Model and GSA Algorithm" Journal of Computing in Civil Engineering, Vol. 29, pp.04014081. - Lee, Y.J., Shariat, S. and Choi, K., (2014) "Optimizing skip-stop rail transit stopping strategy using a genetic algorithm" Journal of Public Transportation, Vol. 17, pp. 1-7. - Li, S., De Schutter, B., Yang, L. and Gao, Z., (2016), "Robust model predictive control for train regulation in underground railway transportation" IEEE Transactions on Control Systems Technology, vol. 24, pp. 1075-1083. - Niu, H. and Zhou, X., (2013), "Optimizing urban rail timetable under time-dependent demand and oversaturated conditions," Transportation Research Part C: Emerging Technologies, vol. 36, pp. 212-230. - Niu, H., Zhou, X. and Gao, R., (2015), "Train scheduling for minimizing passenger waiting time with time-dependent demand and skip-stop patterns: Nonlinear integer programming models with linear constraints" Transportation Research Part B: Methodological, Vol. 76, pp. 117-135. - Trozzi, V., Gentile, G., Bell, M. and Kaparias, I., (2013), "Dynamic user equilibrium in public transport networks with passenger congestion and hyperpaths" Procedia-Social and Behavioral Sciences, Vol. 80, pp.427-454. - Wang, Y., De Schutter, B., van den Boom, T.J., Ning, B. and Tang, T., (2014), "Efficient bilevel approach for urban rail transit operation with stop-skipping" IEEE Transactions on Intelligent Transportation Systems, vol. 15, pp. 2658-2670. - Wang, Y., Tang, T., Ning, B., van den Boom, T.J. and De Schutter, B., (2015), "Passenger-demands-oriented train scheduling for an urban rail transit network" Transportation Research Part C: Emerging Technologies, vol. 60, pp. 1-23. - Xu, X., Li, K. and Li, X., (2014), "Research on Passenger Flow and Energy Consumption in A Subway System with Fuzzy Passenger Arrival Rates" Proceedings of the Institution of Mechanical Engineers, Part F: Journal of Rail and Rapid Transit, pp. 0954409714524378. - Yang, X., Chen, A., Ning, B. and Tang, T., (2016) "A stochastic model for the integrated optimization on metro timetable and speed profile with uncertain train mass" Transportation Research Part B: Methodological, vol. 91, pp. 424-445. - Yin, J., Tang, T., Yang, L., Gao, Z. and Ran, B., (2016), "Energy-efficient metro train rescheduling with uncertain time-variant passenger demands: An approximate dynamic programming approach" Transportation Research Part B: Methodological, vol. 91, pp. 178-210. - Zhao, X., Sun, Q., Zhu, Y., Ding, Y., Ma, C. and Chen, Z., (2016), "Multi-routing planning design of Y-type urban rail transit" Advances in Mechanical Engineering, Vol. 8, pp. 1687814016667385. - Zhou, X. and Zhong, M., (2005), "Bicriteria train scheduling for high-speed passenger railroad planning applications" European Journal of Operational Research, vol. 167, pp. 752-771.